An often-embarassing wardrobe malfunction for women is solved, thanks to an IT consultant who loves clothes. For most people, choosing between making a career in what you’re good at and doing what fulfills you is easy: go to what pays better, in the hopes of pursuing your dreams further down the line. So in October 2011, Felix officially launched Shirt Galerie, an online store that specializes in one piece of women’s clothing: the buttonup shirt with no gaps or—as she calls them—“gapes” or gaping holes. Felix explains: “The ‘gape’ is what I call the splitting of the panels in between buttons of a button-up shirt.” Since button-up shirts “are a staple in every woman’s closet,” they can be worn “to work or during the weekend. With my shirts, busy working women need not worry about accidentally exposing themselves, giving strangers accidental side peeps,” she says. Felix herself was a constant victim of the gape. 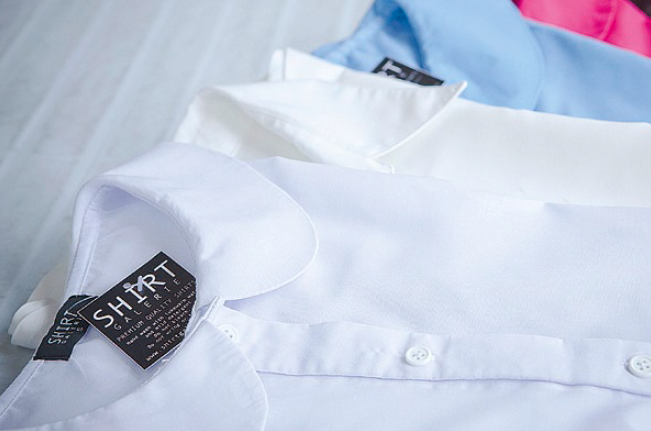 “I had a phase in college when I would only wear white buttonup shirts to school. When I started working, I bought even more shirts to pair with slacks and skirts, because they project a professional look,” she says. Felix’s products have been so well received—within a week of launching her online store, her initial inventory of 24 shirts, priced on average at P780 each, were sold out—that she has been expanding her clothing line. Not bad for a startup that began with “definitely under six figures” in pesos in capital and has only one full-time employee; the rest are subcontracted sewers and pattern makers. “One of my plans is to put up a physical store so that we could reach more customers,” says Felix. “As for the clothes, I focused on basic, staple pieces for the initial collection, but I am also planning to experiment with other styles, prints and fabrics for future collections. I also want to get Shirt Galerie involved with a social cause that empowers women.” That’s also a gap that needs to be filled—and another good choice for Kathleen Felix. Editor's note: Shirt Galerie ceased operations by the end of 2012. But its concept is still a very promising business idea. This article was originally published in the March 2012 issue of Entrepreneur magazine and was recently updated by the online editor. Subscribe to the print or digital version here.